Pastor Arndt was born in Wausau and raised in Menasha, WI. He is the oldest of four children with two brothers and a sister. Dave attended Bethel Lutheran School and Fox Valley Lutheran High School before graduating from both Nortwestern College (1985) and Wisconsin Lutheran Seminary (1989). Dave met his wife Gail in Sturgeon Bay, WI while serving St. Peter Lutheran Church as a vicar. The couple were married in 1989 following graduation from the seminary and assignment to serve as pastor at St. Peter Lutheran Church in St. Peter, MN. In 1995 Dave accepted a call to serve St. John’s in Two Rivers, where they’ve made their home and raised two grown daughters, both employed as Physical Therapists in DePere. Dave enjoys the lake shore outdoors, hunting, fishing, and trying to keep up with the girls in his life. Steve Kruschel was born and baptized in Gregory, South Dakota, on March 25, 1983. His wife, Becca (Janke), was born a few weeks later in Wilmar, Minnesota, on April 21, 1983, and baptized on April 24. After Becca grew up in rural Iron Ridge, Wisconsin, and Steve grew up in Redwood Falls, Minnesota, they met and courted at Martin Luther College, New Ulm, Minnesota. Following graduation, Becca served as a teacher for one year in Japan, while Steve attended his first year at the Seminary. They married July 23, 2006. Steve served as a vicar in Lapeer, Michigan. After graduating from Wisconsin Lutheran Seminary in 2009, Steve was assigned to serve Grace Lutheran Church in Geneva, NE, and Trinity Lutheran Church in Grafton, NE. He served those congregations for 9 years. 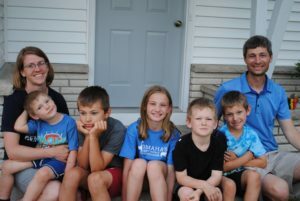 The Lord has blessed Steve and Becca with five children: Adeline (10 years old), Timothy (8 years old), Benjamin (7 years old), Gabriel (5 years old), and Phineas (3 years old).